who loves a silky chocolate glaze as much as i do? i just can't resist a shiny dipped donut! 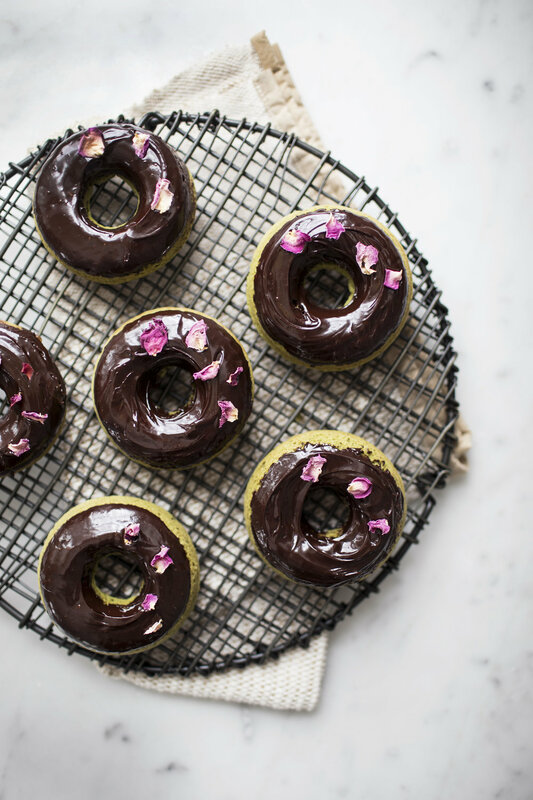 instead of topping these green tea + chocolate glazed donuts with sprinkles, i topped them with dried rose petals. i know, i have been kind of obsessed with using dried rose petals this month, but it is february & they are too pretty not to sprinkle over every dessert! 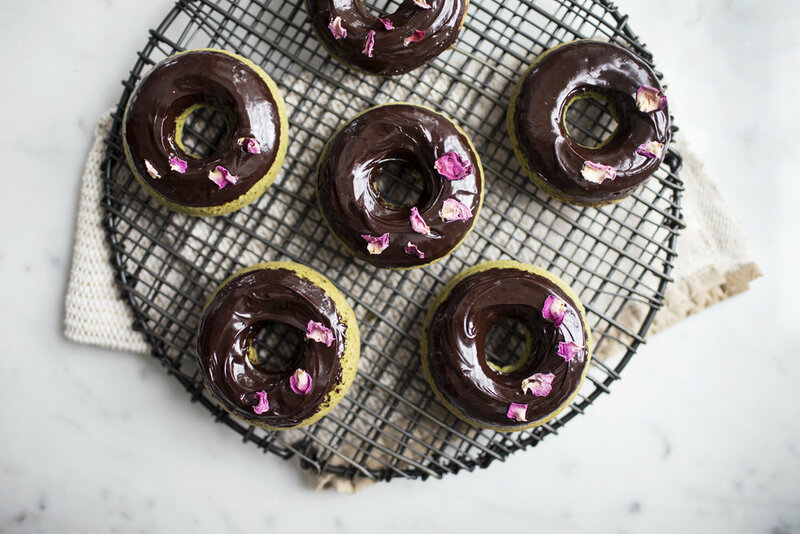 the rich dark chocolate glaze pairs so well with the green tea based donut batter, made with aiya matcha's cooking grade matcha powder. be sure to use a quality dark chocolate for the glaze, as it is important for achieving a rich tasting base. because the donuts are baked, you do need a special donut pan to make these (which you can find fairly cheap on amazon). that being said, it is so much easier to make these, then make a yeast based deep fried donut. give a batch of these to your valentine or serve them at a galentine's party this upcoming long weekend! everyone will go nuts for this unexpected flavour combination. it is not often you come across a green tea donut! i have one more special valentine's recipe to share with you this week & i will do a final valentine's round up too. oh, i just love february baking! preheat oven to 350 degrees. lightly grease two donut pans. in a large mixing bowl whisk together the butter & brown sugar until combined. add the egg, milk, vanilla & matcha powder. mix until well blended. sift in the flour, baking powder, baking soda & salt. beat until a smooth batter is formed, about 60 seconds. transfer filling to a piping bag fitted with a large plain tip. carefully pipe filling in prepared donut pans, filling them just over halfway. bake for 12 to 15 minutes, or until the tops bounce back to touch. let cool completely before removing & glazing. in a microwave safe bowl add the chocolate, butter & whipping cream. microwave in 15 second increments until the chocolate is fully melted. whisk in the vanilla & powdered sugar until silky smooth. immediately dunk each donut top in the glaze. the chocolate will begin to harden, so glaze those donuts quickly! garnish with rose petals & let stand 15 minutes to allow the glaze to cool. enjoy! this post was created in partnership with aiya matcha!